Plex is media streaming software and infrastructure for both client and server side, this is a quick guide and information about Plex coming from someone that has been using xbmc in all its forms around 8 years. Unlike xbmc which could see any smb share over your network Plex require you to install media server software on your pc. Plex Media server is available for multi platforms including Windows, Mac, Linux, NAS , I am running it on Windows 8.1 at the moment. To set up Plex Media server you just need to download from the official site HERE, once done just install the software, now this is where it is different from using xbmc as with xbmc all you needed to do was set up a normal windows share a directory on your computer then get the client of xbmc to look at that directory and then locally on your xbmc client it would then categorize your media including downloading covers, TV / film / music information and then create the database on the client. 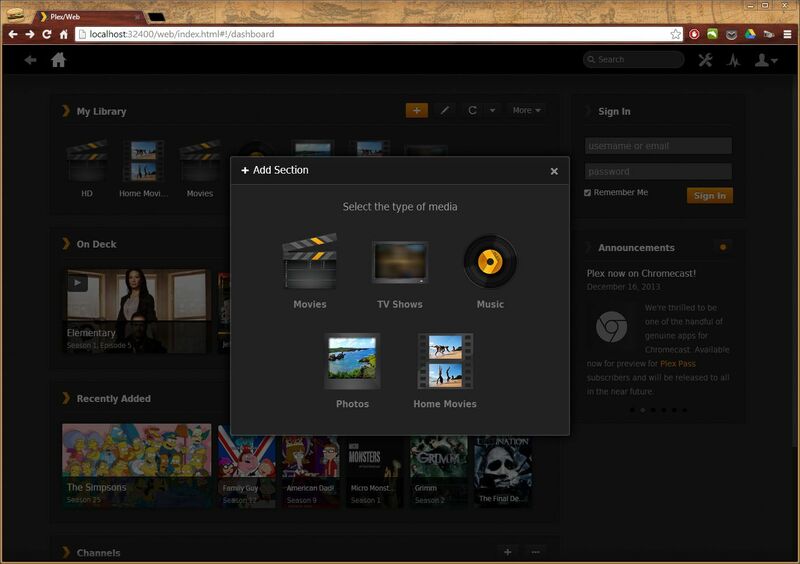 Within Plex you need to setup the media directories up for the various media you want to share including, TV shows, films, music, photos etc and this creates the database on the server to do this go into the Plex Media manager, which is through your webbrowser, under my library click the plus sign you then get to the add content section, click the type of files you want to add, you have a choice of movies, TV shows, music, photos or home videos, though you can use these as a starting point for any other media. One you click the type of media you can then add your directories, you can also add multiple directories, under advanced section you can change the default media scanner for that type of file, language etc. This will then create the database in the background. Depends on how many files depends on how long it takes, the first time it set it up it took overnight just to scan my music directory but there was loads in there. Once all this is done that is really all you need to do I have my Plex server set to automatically scan these directories for any changes, so if I copy a new TV show it will show the file within the library automatically, though if you need to you can force a manual scan. Sometimes the scan does get the wrong information for your file, if it does you can update the information for just that file, by going to the file and then edit, this includes even changing the cover photo as well as the information for that file. Also if you TV shows are not named correctly on your computer Plex may not see them so make sure they have the relevant information in, season and episode number ie S01E01 etc. Within the Plex server and client it is organised with on deck which is the latest things you have watched, listened to etc, then recently added and then channels. The channels is where you can add addition services including iplayer, YouTube etc. There is a purchase option for Plex which is called plexpass this is a monthly charge and allows you to access your media from anywhere where you have a Internet connection, though if you just want to run on your local network you don’t need the Plex pass. Creating the database of media on the server works a lot better than setting it up on the client as this mean that when you add a new device all your media information is already there and you don’t need to collate it again, this was always the problem with xbmc as any new device would take ages to set the up. I used to run xbmc originally on the original Microsoft xbox, though you did need to mod them to be able to do this. Using the original xbox was great for streaming standard Def content, but once you could get hd content it couldn’t cope, so I moved up to using a old pentium 2.8 slimline pc as the main client in the living room running xbmcubuntu, but still using the original xbox’s in the bedrooms for streaming sd content, also have used modded Nintendo wii consoles with wiimc on to stream sd content and even 480p. The Plex client is available for all devices including, Android, iOS, windows, smart TV, chromecast, roku etc, I run the Android version on the tablets we have around the house and for under the TV’s we now use modded nowtv box’s these are cheap and great units for running Plex though you kind of need to hack them see HERE for full details. If the client you are running Plex on does not have the full power to decode what your are streaming, as long as you are running the server software on reasonably powerful pc, the media software will transcode the file and stream on the fly to your low end device. So directly there is no minimum spec for the client that you want to run Plex on. The one great thing with using Plex is that you can resume what you was watching on one device onto another, so say you have started to watch a film in your living room and decided you wanted to carry on watching upstairs on your tablet, just stop the film downstairs then when open Plex on your tablet your film is listed as the latest on your deck, click on it and your film will resume in exactly the same place. You can also see if you have watched one thing or part way though as there I a small circle icon that shows progress in a orange colour. I was apprehensive at first to using Plex as was so used to the way xbmc worked and knew the software inside and out on all devices, but moved over to Plex as the client for Android I just couldn’t get to work as I wanted. But now really glad started using Plex around the house on our local network as can stream anything to any device even full hd content to devices that wouldn’t normally be able to cope. I haven’t had any problems with any media type including mp4, mkv, x264, divx, even programs that I record using the TV tuner I have in the pc through the official windows media centre software, which as you know is really a non standard video container file. I find using streaming like this better than having just a media box with a hard drive in like the sumvision cyclone player though these are still great see HERE for full details on the sumvision media centre.